Pastor JD has changed his tune on this teaching. On today’s YouTube update Pastor JD will just explain. I’m very impressed with his action. It is tragically THE FIRST TIME I have seen such humility in a Calvary Chapel pastor. Good Job JD. The rest of them should swallow their pride and follow your example. Aloha JD if you sneaking peeks on my blog. James Jacob Prasch questions JD Farag the pastor of Calvary Chapel Kaneohe over his non-traditional pre-trib views, specifically JD’s interpretation of 2 Thessalonians 2:3, JD’s mis-interpretation of the word “apostasia” (Strong’s 646), the rapture of the church, and the current global apostasy. Jacob Prasch is calling for a symposium or a discussion on this topic, not division. Jacob Prasch praises JD and the CCA (Calvary Chapel Association) for taking “something of a stand” against Brian Broderson departure and I agree. (that is, they didn’t really take a hard enough stand). Emergent doctrines and practices plague all the larger Calvary Chapels I have been to and I have yet to hear any Calvary Chapel Pastor voice a strong stand against the apostasy/departure that is flooding the charismatic churches today. Jacob Prasch then says, “Without intending to offend anyone”, (pretty sure they ARE going to be offended) Jacob Prasch makes the case that this is clearly the teaching of the rank and file Calvary Chapel’s and most other Charismatic churches today and it is just the tip of the iceberg in my opinion, of the many problems facing Calvary Chapels and all of Christendom today. Jacob Prasch then describes how the 2nd generation of Calvary Chapel leaders are not as learned as Pastor Chuck or Paul Smith. Jacob also says it’s always milk teaching at Calvary Chapels nowadays and there are not many pastors at Calvary Chapels anymore who value actual academic bible study. Jacob Prasch goes so far as to describe JD as basically “untaught” as compared to more formally qualified scholars such as Arnold Fruchtenbaum or John Walvoord or Mark Hitchcock. I love intelligent debates and would eagerly welcome a reply from Pastor JD. As for myself, I have a copy of Fruchtenbaums “Footsteps of the Messiah, the Sequence of Pre-tribulational Events” in my library. I decided to take a look and see if Dr. Fruchtenbaum indeed taught pre trib like JD Farag of Calvary Chapel Kaneohe or more like Jacob Prasch was asserting. 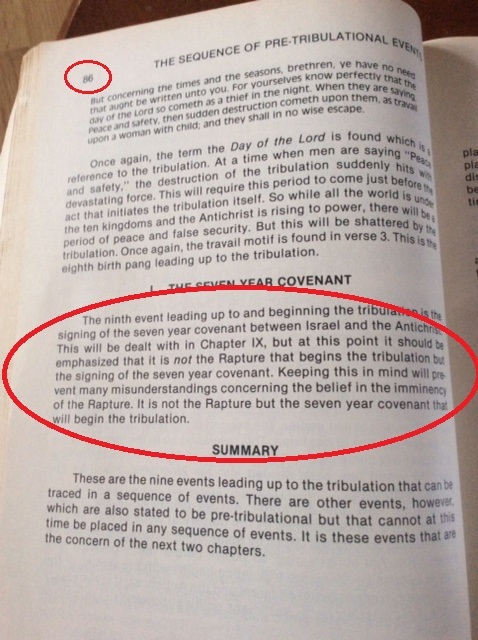 On pages 85-86 Dr Arnold Fruchtenbaum clearly teaches the rapture of the church does NOT begin the tribulation. Dr. Arnold Fruchtenbaum teaches it will be the confirming of the 7 year covenant that begins the tribulation, NOT THE RAPTURE. This is traditional “pre-trib” vs the “imminence” doctrine popularized by Tim Lahaye, Thomas Ice, JD Farag and pretty much the rest of the Charismatic movement. The problem that Jacob Prasch and others like myself have with JD Farag of Calvary Chapel Kaneohe are this. JD Farag of Calvary Chapel Kaneohe makes accusations that “whoever doesn’t teach a imminent rapture pre trib view is a false teacher” and the word “apostasy” in 2 Thessalonians actually means “rapture”. I agree with Jacob Prasch, we shouldn’t be accusing each other but rather discussing what we have in common which is much more. Jacob Prasch wraps up the video using the church in China as an example of being an actually prepared church vs a falsely secure church and which one has survived communism and persecution. I really enjoyed Jacobs scholarly presentation and think it is so well done I am sharing it on all my social media platforms and by email and text to my friends, family and others. This entry was posted in Apostate Church, Calvary Chapel, Celebrity Evangelism, Christianity, Emerging Church, Uncategorized and tagged Bible, Celebrity Evangelism, Emerging Church, Revelation on April 21, 2017 by mikeuslan. I completely agree with all you’ve posted. I was unaware of Brother Farag’s teachings concerning this. I researched on his website (I prefer reading transcripts to watching videos) and found two prophecy updates where he details his opinions on apostasy. He sadly states in one of them (I think August) that to disagree with his interpetation of the timing of the events is to be a deceiver and deceived, and to risk damnation. In both updates he referred to such people as the unfaithful servant in Matt 24 who is cut to pieces and cast out. Those are very serious words to speak of other believers over a non-essential. Salvation is not dependent on eschatology. I hope Brother Farag responds in love and humility. Perhaps he will still believe in that poor interpretation of apostasy, but hopefully he will teach his congregation that this is his own understanding and it is refuted by most scholars. And I pray he realizes and admits to going too far in his judgment of those who believe differently. Tina, thanks for posting. Do you remember what dates he made those comments? I would like to see those notes. August 26, 2012 and Sept 08, 2013. I don’t know how to post the links on a mobile. They can be found at Calvary Chapel Kaneohe’s website. I updated the post with a link to JD’s notes. Thanks Tina!